This web page is dedicated to the members of Flat 10 during the year of 2002- 2003. 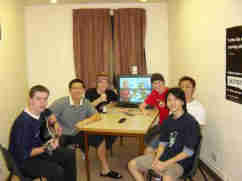 We are; Mike, Will, Matt, Chin, Chee Wei and Ivan. It aims to tell you a bit about us and what we like to do, as well as containing links to our favourite sites and respective academic departments at the university.